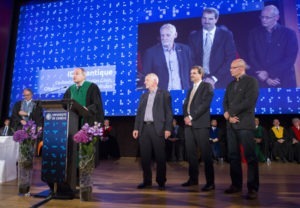 On Friday, October 13th 2017, ID Quantique’s co-founders Professors Nicolas Gisin, Hugo Zbinden and also current CEO and founder Grégoire Ribordy, were awarded the prestigious Medal of Innovation by Jean-Marc Triscone, Vice Rector, University of Geneva (UNIGE), at the Ceremony DIES ACADEMICUS UNIGE. This, the latest in a number of international accolades received over the years by ID Quantique, was presented in honor of the company’s significant contribution to the scientific community throughout its 16 years of operation. Today, ID Quantique’s innovations are used by governments, academic institutes and companies in over 60 countries around the world. The company has grown to be the world’s market leader for quantum cryptography and random number generation. On presenting the Medal of Innovation, Jean-Marc Triscone, commented on the significant technological advancements made by the company, and the crucial role that quantum technology will have on “the security of the future”. He then congratulated the trio, before continuing to say, “The long-term vision of ID Quantique, which I wish to emphasize, you also apply to the development of your business, is evidenced by your many commitments to reduce your impact on the environment, your journey is the result of your commitment, and ID Quantique embodies a mission dear to our University, that of encouraging the links between academic excellence, innovation and the local fabric”.